I’m posing that question somewhat rhetorically. The answer happens to be the theme for Percona* Live 2016‌ – “Database Performance Matters!” Databases are ubiquitous- if not also invisible, managing to hide in plain sight. Reading this blog? A database was involved when you signed in, and another one served up the actual contents you are reading. Buy something from Starbucks this morning and use their app to pay? I’m not an expert on their infrastructure, but I will hazard a guess that at least one database was involved. So why the mention of Percona Live 2016? Well, recently I was offered the opportunity to speak at the conference this year. The conference takes place April 18-21. For those able to attend, the session I’m delivering is at 11:30am on April 19th. The session is titled “Performance of Percona Server for MySQL* on Intel® Server Systems using HDDs, SATA SSDs, and NVMe* SSDs as Different Storage Mediums”, creative and lengthy, I know… Without revealing the entirety of the session, I’ll go into a fair amount of it below. I had a framework in mind that involved SSD positioning within MySQL, and set out to do some additional research before putting the proverbial “pen to paper” to see if there was merit. I happened upon a talk from Percona Live 2015 by Peter Zaitsev, CEO of Percona, coincidentally titled “SSD for MySQL‌”. 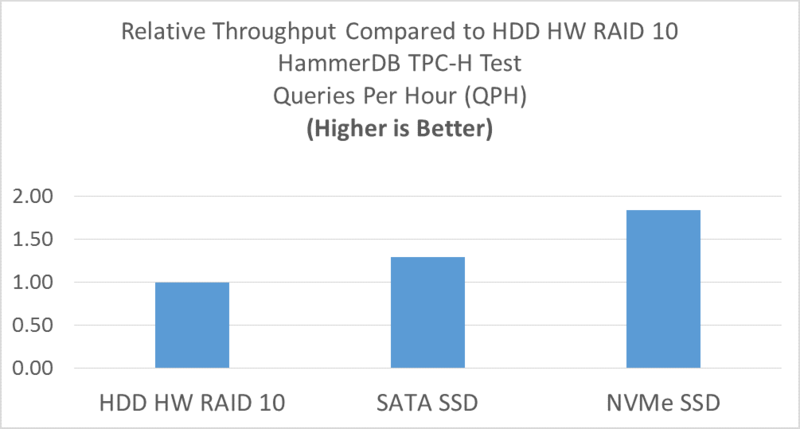 It’s a quick read, eloquent and concise, and got me thinking- just how much does storage impact database performance? To help understand the answer, I need to offer up a quick definition of storage engines. Database storage engines are an interesting topic (to me anyway). The basic concept behind them is to take a traditional database and make it function as much as possible like an in-memory database. The end goal being to interact with the underlying storage as little as possible, because working in-memory is admittedly preferred/faster than working with storage. Generally speaking, performance is good and consistent so long as the storage engine doesn’t need more memory than it has been allocated. In situations where allocated memory is insufficient, and these situations do arise, what happens next can make or break an application’s Quality of Service (QoS). Percona Server, with its XtraDB* storage engine, is a drop-in replacement for MySQL. So, I figured it was time for a quick comparison of different storage solutions behind XtraDB. One aspect I would be looking at is how well XtraDB deals with memory pressure when a database’s working set exceeds the RAM allotted to XtraDB. This can be greatly influenced by the storage subsystem where the database is ultimately persisted. 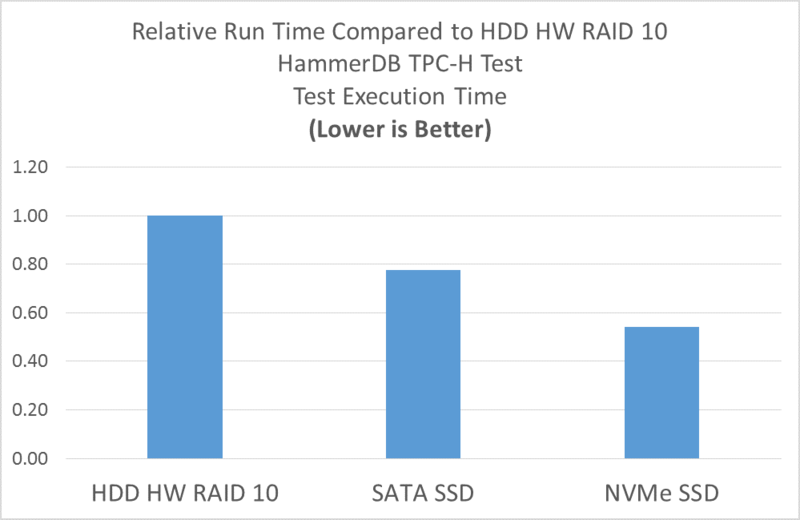 To simulate these situations, I decided I would run a few benchmarks against Percona Server with its storage engine capped at sizes less than the raw size of the databases used in the benchmarks. This would create the necessary memory pressure to induce interaction with storage. 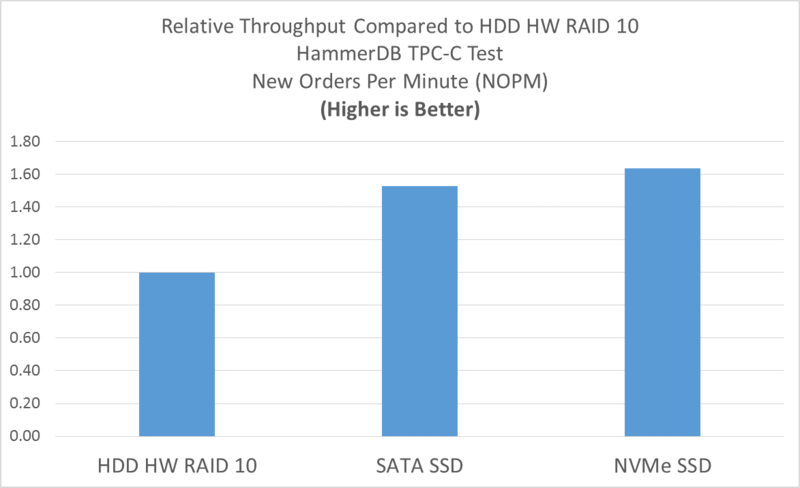 For the storage side of the equation, I decided to compare a RAID of enterprise-class SAS HDDs against a SATA SSD and also against an NVMe SSD. My results are presented as relative to those of the HDD solution. Rather than report raw numbers, the focus here is to highlight the impact storage selection has on performance rather than promote any single configuration as a reference MySQL solution. SysBench* 0.5: Open source, cross platform, scriptable, and well-known in the MySQL world. SysBench provides modules for testing multiple aspects of a server, and for my testing, I used the modules for file I/O performance and database server performance (OLTP). For SysBench results, well, I have to keep something for the talk at Percona Live, not to mention the brevity of this blog, so those are not recapped below. HammerDB* 2.19: Also open source and cross platform, HammerDB provides a nice wrapper for running workloads based on/similar to TPC-C and TPC-H created by the Transaction Processing Performance Council (TPC*). HammerDB results are illustrated below. All in all, this was an interesting (if not fun) exercise. Six HDDs or a single SSD? Relative performance results aside, one should also consider power consumption, reliability, and opportunity cost savings that derive from performance gains over the life time of a hardware platform, as often these can be more substantial than the upfront costs. Speaking of upfront costs, the Percona Live talk itself also addresses the relative upfront cost of each storage configuration, which makes for an interesting conversation when that information is juxtaposed against usable capacity and performance results.